Whether you prefer your pancakes with something sweet or savoury on top, here is a basic pancake recipe to get you on your way. Whisk the eggs in a separate bowl, then add the water and milk and whisk together again. Add the wet ingredients to the flour. Whisk together until smooth. Not too smooth, mind! Small lumps of flour are good! Heat oil in pan over high heat until very hot. When oil is hot enough turn heat down to medium heat and add half a cupful of batter, tilting the pan to allow the batter to spread. When the edges are dried and crinkly it’s time to turn your pancake. Enjoy with the topping of your choice. 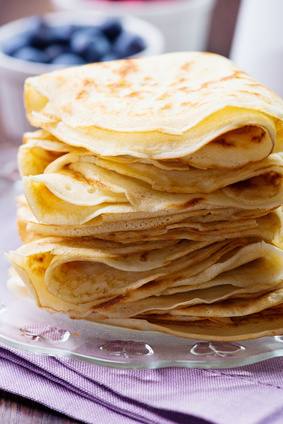 Pancakes can be stored in a freezer bag, each one separated by a layer of greaseproof paper, then frozen for a quick and easy snack another day. Click here for our 5 top tips to making perfect pancakes.